Maternity patterns are the best thing that ever happened to your budget. 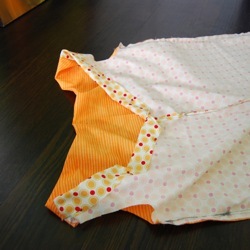 By sewing your own maternity clothes you'll save so much money (well, assuming you don't buy expensive fabric) you'll have some left over to buy food. Why are maternity clothes so expensive? I designed this maternity shirt pattern in a way that it can be adjusted and worn after pregnancy too, much like my maternity wrap skirt pattern is. No reason to make something you'll only wear for a few months! 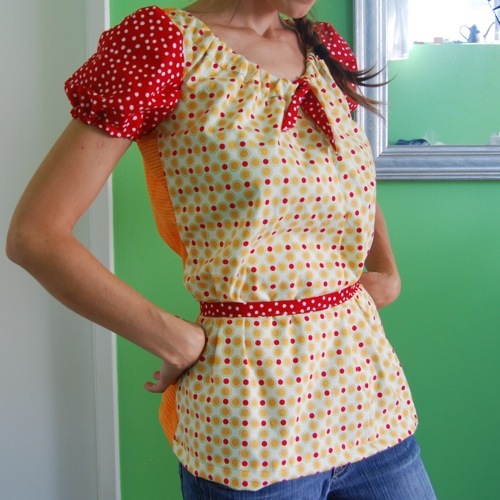 With this pattern you'll have a cute top durig pregnancy, during the immediate "nothing fits" months after and for years to come with an adjustment of how you tie the belt. Yes, I picked crazy fabric for my top and I totally understand if those bright colors make you cringe. I wanted something unusual in colors I rarely wear. Just try to imagine the same top on one solid color if that helps. This one fits a size small about 34-36" bust. 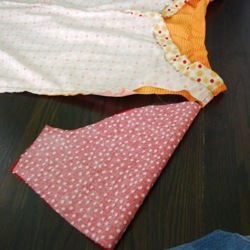 I used quilting weight cotton for this top but honestly, I'd sew it in a stretch jersey if I were to do it again as that will give a few more inches during late pregnancy. I also would suggest adding a few inches to the length. Or maybe that is just me, my belly gets huge in pregnancy. Huge! Here is my Maternity Shirt Pattern in PDF format for you to print. As with all my maternity patterns, they are for your personal use only. Plese do not sell from or reproduce my pattern for sale. First, print out the PDF, tape it all together and then cut out the pieces to trace. 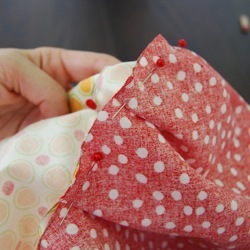 A 1/4" seam allowance is included, so just cut right on your trace line. I used different colors for my pieces, you can do all solid if you want, totally up to you! 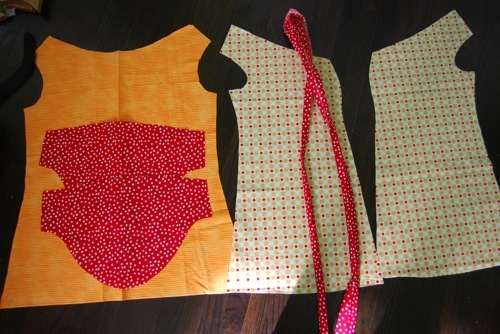 You will also need to cut a 3" by 40" strip for the neck tie and a 3" by 50" strip for the waist. 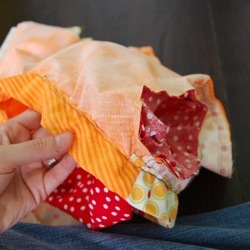 Fold the strips the long way and sew the edges. Sew the "V" that will become the v-neck opening and then put right sides together of your front panels and sew together. 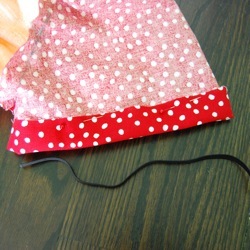 Place your front and back right sides together and sew the sides. 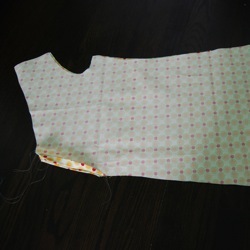 Next, fold down and pin the neckline where the tie will feed through and sew. 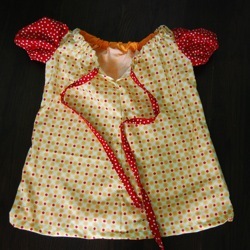 Fold the sleeves in half, pin and sew as shown. Then you'll need to pin the sleeve onto the arm holes. This is the trickiest part of these maternity patterns. 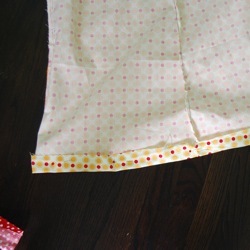 I pin the top to the top and the seam to the seam. Then, bunch your sleeves evenly around and pin then sew. 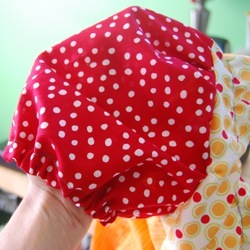 You can see what I mean by folding the fabric in the photo below. 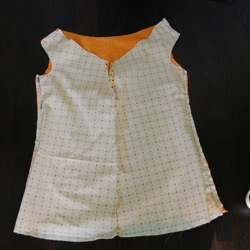 After pinning, tuck the sleeve into the shirt so you can easily sew the sleeve on. Then fold your sleeve edge to create the casing for the 10" strips of elastic. 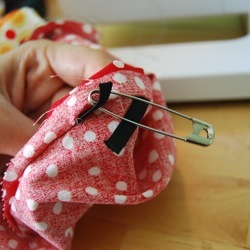 Sew the casing and use a pin to feed the elastic through. 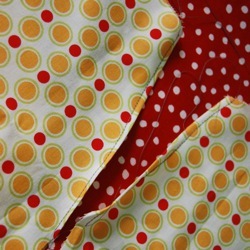 Then sew the elastic edges together and close the casing hole. The sleeves are done! The hardest bit is over! 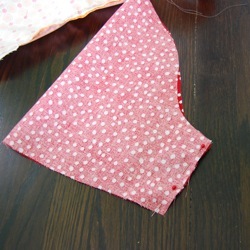 Now turn and hem the bottom edge and then feed the tie through the neck. You'll notice in the photo below I started off with a much larger tie. (This one was more like 65" or so) I shortened it, didn't like it. Feel free to play around with the tie length! Also, the waist best is optional, you can wear the shirt "tent style" without a best too as sown in the photo below. I hope you enjoy my free maternity patterns & happy sewing!! Go back to the Maternity Patterns section. Back to the top of the Maternity Shirt Pattern page.